Background Locally relevant research is considered critical for advancing health and development in low- and middle-income countries (LMICs). Accordingly, health research capacity strengthening (HRCS) efforts have intensified, increasingly through consortia. Yet, the knowledge base for managing such consortia is not well defined. This review aimed to ascertain the scope and quality of published literature on HRCS consortium management processes, management-related factors influencing consortium operations and outcomes, and the knowledge gaps. Methods Given the paucity of published HRCS literature, a ‘systematised review’ as outlined by Grant and Booth was conducted, modelling the systematic review process without restriction to research-based publications. 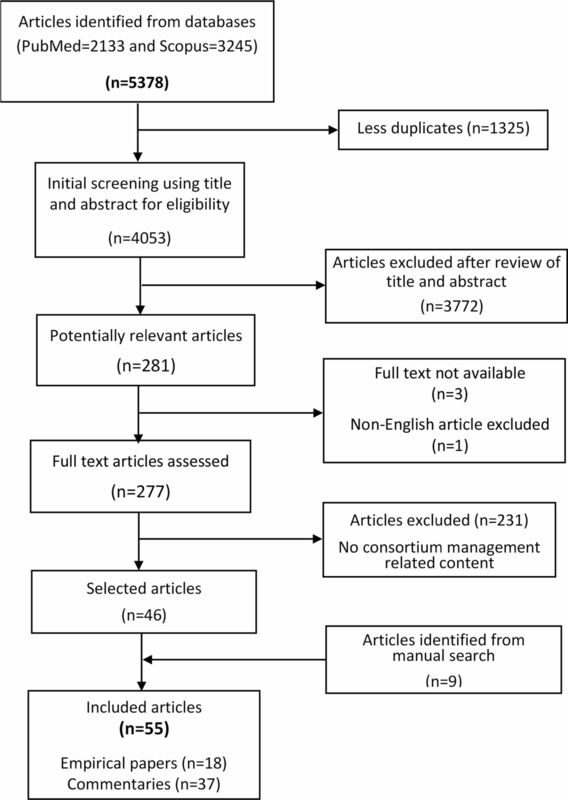 A systematic search in PubMed and Scopus was carried out coupled with a manual search for papers using reference checking and citation searching. A quality appraisal of eligible articles using the Mixed Method Appraisal Tool was undertaken. Thematic synthesis was used to analyse the extracted data. Results The search identified 55 papers, made up of 18 empirical papers and 37 commentaries focusing on consortium-based HRCS initiatives involving LMICs and reporting management-related data. The review indicates increasing efforts being made in the HRCS field in reporting consortia outcomes. However, it highlights the dearth of high-quality empirical research on HRCS consortium management and the nascent nature of the field with most papers published after 2010. The available literature highlights the importance of relational management factors such as equity and power relations in influencing consortium success, though these factors were not explored in depth. Operational management processes and their role in the capacity strengthening pathway were rarely examined. Conclusion Findings indicate a weak evidence base for HRCS consortium management both in terms of quantity and conceptual depth, demonstrating the need for an expanded research effort to inform HRCS practice. The recognition of the fundamental role of research in advancing health and development has resulted in substantial investments in health research capacity strengthening (HRCS) consortia in low- and middle-income country settings. Very little attention has been given to consortium management in the literature, and the current evidence is characterised by a lack of high-quality empirical research. The available evidence highlights the importance of relational elements of consortium management such as equity and power relations but does not explore these elements in depth. Operational management processes adopted and their role in the capacity strengthening pathway were rarely examined. There is a need to strengthen the evidence base on the role and contribution of consortium management processes to broader HRCS capacity development initiatives. Health research has been recognised as an essential tool in addressing health and development challenges, yet the capacity of many low- and middle-income countries (LMICs) to conduct locally relevant research is still low.1 2 In the last three decades, several calls to action have been made for sustainable health research capacity strengthening (HRCS) in LMICs,1–4 resulting in substantial investments in a wide range of initiatives.5–7 Mechanisms for developing research capacity in LMICs have evolved over the years, progressing from the provision of technical assistance to individual-focused training, and more recently towards institutional and system-wide approaches.8 9 One of the main strategies adopted over the period has been the teaming up of institutions to implement these programmes.6 10 Though such groupings refer to themselves by various names such as partnership, consortium, and network,11–13 we will use the term ‘consortium’ in this paper. HRCS consortia typically consist of individuals and institutions from both high- and low- and middle-income countries pooling their varying levels of resources, expertise and experience and working together towards collective gains in health research capacity.14 15 While these consortia are often led by high-income country partners,16 17 there is a rising trend of LMIC-led consortia such as those that were supported by the Wellcome Trust’s African Institutions Initiative and its successor, the Developing Excellence in Leadership, Training and Science Africa Initiative, the USA National Institute of Health’s Medical Education Partnership Initiative, and the European and Developing Countries Clinical Trials Partnership Programmes. There are indicators of increasing attention to consortium management practices in HRCS initiatives. Examples include the requirement by some funding bodies for explicitly stated consortium management outputs in programme theories of change,30 and the development of consortium management tools such as the research fairness initiative31 and guides for research partnerships.32 33 It is clear that consortium management is an integral part of the global HRCS effort, and a robust evidence base including understanding consortium management processes and practices and their effectiveness is essential. This review aims to ascertain the breadth, depth and quality of the published evidence on HRCS consortium management, and identify the management processes, experiences and key issues raised by consortium actors, and the knowledge gaps in the available evidence. Due to the paucity of robust HRCS research publications,34 conducting a standardised systematic review which requires high-quality research evidence35 36 was not feasible. We thus conducted a systematised review, which models the systematic review process without strict adherence to study inclusion criteria.35 We aimed to be widely inclusive to draw out the full range of HRCS consortium management-related data in the published literature, necessitating the inclusion of all types of peer-reviewed literature without limitation to publication type (research based or not) and quality. A systematic electronic search of peer-reviewed articles using PubMed and Scopus was conducted without any date restrictions. The search was limited to peer-reviewed literature as the aim of this review is to identify the extent of and findings from existing scientific literature pertaining to HRCS consortium management. The search terms used were (1) health AND (2) research AND (3) capacity AND (4) strengthening AND (5) consortium AND (6) LMICs, together with variants of some of the terms (online supplementary table S1). LMIC is defined according to the current World Bank classifications.37 Four geographical regions with the highest concentration of LMICs namely Africa, Asia, Latin America and the Caribbean, and Pacific were included to optimise the search. Results were saved in an Endnote X8 library. Though there was no quality threshold for inclusion, an appraisal of the selected articles was carried out to give an indication of the quality of the current evidence on HRCS consortium management. The Mixed Methods Appraisal Tool (MMAT) was used due to its suitability for appraising multiple design studies.39 The tool includes screening questions which assess the eligibility of papers for full appraisal. It comprises sets of criteria for qualitative, quantitative and mixed studies, and metrics for determining the overall quality score for each study.40 The empirical papers were screened and the qualifying papers assessed for methodological quality and scored. A second reviewer conducted an independent appraisal of all the papers. An initial discussion between the two reviewers was held in advance to ensure a common understanding of the tool. A third reviewer facilitated the resolution of any divergences. Data were extracted from the selected papers using the matrix method.41 This method provides a structured way of recording extracted information and findings from each publication using a table, facilitating a systematic synthesis process. Columns representing specific areas of interest were used to capture data. These included the following: publication authors and year; characteristics of the HRCS programme such as goals, main activities and geographical focus; and consortium characteristics such as structure, size and composition. Study objectives and design, methods used in data collection, sampling and analysis, and frameworks or guidelines applied were also obtained from empirical papers. Findings from each paper were categorised into three broad areas: (1) descriptions of management processes and systems adopted during the consortium’s formation and implementation, (2) experiences and lessons learnt and (3) effect of the processes and experiences on the achievement of programme goals. A thematic synthesis of the extracted data was then carried out which involved inductively identifying any descriptive and analytical themes, as well as similarities, divergences and associations across papers. To strengthen the rigour of the process, each step and output was independently assessed by a second reviewer. The electronic search yielded 5378 papers of which 1325 duplicates were removed, retaining 4053 (figure 1). In all, 3772 articles were rejected based on a review of the title and abstract, and an additional four were excluded as the full texts were not accessible for three and the fourth was not available in English. Of the 277 potentially relevant articles, 46 were retained after a full-text review, and a manual search identified nine additional articles, resulting in 55 included papers made up of 18 empirical papers and 37 commentaries (table 1). A detailed summary of the papers is presented in online supplementary table S2 and S3. Paper screening and selection process. Only one paper was published before 2000, with the majority (47 out of 55) published between 2010 and 2017, indicating a sixfold increase compared with the period preceding 2010 (figure 2). The highest number of papers published in a year was eight. Half of the papers (n=28) had neither the first nor last authors affiliated to LMIC institutions, and in a fifth, there were no LMIC-affiliated authors at all (table 1). Last authors (48 out of 55) were primarily affiliated to high- and upper middle-income countries. Number and type of publications per year. HRCS, health research capacity strengthening. Included papers sought to evaluate or reflect on the consortium’s operations particularly on the activities and outputs, with only a third primarily focusing on the partnership experience, assessing the successes, challenges and lessons learnt from the perspective of consortium actors. Evaluation of consortium management processes was the sole or prominent aim of only two papers,42 43 one of which happened to be the only paper reporting a failed consortium. The 51 consortia varied widely in size, ranging from 2 to 20 institutional partners. The HRCS programmes included LMICs, mostly in Africa (n=38). Of the 41 consortia that had reported on leadership, 32 were led by high-income country partners (table 1). As shown in table 1, HRCS was either the primary focus of the programmes or a component of a broader research, educational or clinical care programme. Consortia sought to build capacity using a single or combination of activities, mostly training of individuals (short term and degree awarding) and learning ‘on the job’ through conducting collaborative research. None of the papers indicated the process used or factors that determined the selection of HRCS activities. A range of management structures and processes adopted by consortia during their inception and implementation phases were reported across papers. These included partner selection and partnership development during the inception phase, and management structures, coordination, and monitoring during the implementation phase. These were neither the primary focus of the publications nor examined in detail, but rather brief descriptions introducing or providing context for studies and reflections. Below, we present data on operational processes used in the HRCS inception and implementation phases as well as data on relational aspects of consortium functioning (table 2). Most consortia were formed in response to an HRCS funding opportunity and were initiated by the primary grant holder or principal applicant. There was one exception, where formation was the initiative of a government representative from the LMIC.49 Criteria for partner selection were discussed in 22 papers (figure 3), with the most cited criteria being previous individual and institutional working relationships (n=17), and expertise or experience in the disease or research area (n=9). Many papers (n=11) reported considering two or more criteria. It was not indicated in any paper if there were any considerations for determining the number or type of partners. Partner selection criteria used and the number of publications that mention criteria. In 11 cases, consortia reported engaging in a partnership development process also referred to as an ‘engagement phase’,50 ‘inception phase’42 51 or ‘establishment process’.52 Typically, this process was used to facilitate partner and stakeholder engagement, identify partner needs and expectations, determine consortium goals, assign roles, establish governance structures, consortium guidelines and procedures, and develop a plan of action. This phase or process was reported to promote openness, trust and build team work,52 as well as help partners acknowledge and deal with any assumptions held.53 Only three papers51 54 55 described the use of a framework or tool to guide this process, citing the Partnership Assessment Tool, the four-dimensional Appreciative Inquiry Framework and the International Participatory Research Framework, respectively. In all, 21 papers mentioned activity coordination processes, and 22 indicated the incorporation of monitoring and evaluation elements. The most cited platforms for coordinating activities and monitoring progress were consortium meetings, management meetings and partner visits, as well as telephone and electronic communication. Factors reported to foster coordination and monitoring included regular communication, jointly determined goals and processes, previous working relationships, and the use of codes of conduct and guidelines.60 66 67 Lack of clarity about roles and guidelines,43 50 and difficulties in organising meetings due to physical distances, time differences, conflicting partner priorities, and poor internet connectivity were reported as barriers particularly in large-sized consortia.60 68 69 Most of the 18 evaluations reported, whether internally or externally conducted, were programmatic in nature, focused on assessing training and research outputs, with only six reporting on partner relations and partnership successes and challenges. Frameworks used to guide these evaluations were reported in six cases. These included the Swiss Commission for Research Partnerships with Developing Countries’ Guide for Transboundary Research Partnerships,19 65 Mercer et al’s70 Guidelines for Assessing Participatory Research Projects,50 the Capacity WORKS Model,43 Kernaghan’s types of partnerships48 and the realist methodology approach.49 These frameworks are orientated towards examining research partnerships more broadly, with only the Capacity WORKS model71 tailored specifically to capacity development programmes. The four critical factors identified from the range of successes, challenges, enablers, barriers and lessons learnt shared across papers were relational in nature specifically building partner relationships, equity and power, leadership and inclusion. Although interrelated, we present the data shared on these key factors in turn, returning to the potential interplays in the discussion. In all, 24 papers discussed inequity and power imbalances among partners, most often in terms of the inequitable division of resources, control and benefits. These were noted to have stemmed from pre-existing asymmetries between partners, as well as consortium design factors.77 78 Pre-existing asymmetries were reported to be based on differences in partners’ resources, income levels and expertise, with differences between North and South partners most often noted. These asymmetries predisposed consortia to power imbalances, exacerbated by consortium arrangements for access to funding, resource allocation and leadership.77 78 ‘Lopsided’ arrangements were reported to result in more-resourced partners taking up more conceptual roles and being perceived as capacity providers, and less-resourced partners becoming implementers and capacity receivers.51 73 78–80 Thus, unequal power relations are entrenched, and the ability of less-resourced partners to negotiate better terms undermined. To the authors’ knowledge, no previous reviews have been conducted to ascertain the state of the evidence base for HRCS consortium management. This review seeks to provide a first step in assessing the consortium management publication landscape specifically in the HRCS domain and to draw attention to the need for purposeful HRCS-specific management science. We note that findings presented may not represent the entirety of HRCS consortia experiences. All but one paper reported successful collaborations, and discordant leader or partner perspectives were only reported in one case, indicating the possibility of publication and social desirability biases, respectively. Indeed, one participant disclosed their consortium’s deliberate decision not to report their ‘dirty laundry’ in a peer-reviewed publication.48 Thus, experiences of unsuccessful consortia may exist but are unpublished, and authors and study participants of selected papers may have been cautious in their publications and responses to avoid potential tensions and maintain relationships. Data from unpublished work or those published outside of peer-reviewed journals, or in languages other than English, or indexed in other databases, would have been excluded from this review. However, we used a systematic approach in carrying out the review ensuring a high level of rigour, and integrated diverse types of published literature to widen the range of included viewpoints. The review indicates an increase in attention being given to HRCS consortium management-related issues in recent years. Yet, yearly publication outputs remain low, and the available evidence is weak both in terms of quantity and quality. Consortium management was not a clearly defined focus for most papers, and there was little coherence in its assessment across papers. The absence of LMIC authors in a significant proportion of publications also raises questions about the level of meaningful LMIC involvement and leadership in the LMIC-focused HRCS consortium management literature. Possible contributors to this authorship pattern include the dominance of high-income partners in consortium leadership, and broader structural and contextual factors which contribute to this imbalance such as resource and expertise constraints. Of note is that the nascent nature of the management-specific evidence reflects a similar trend in the broader HRCS literature, except that there is a better representation of LMIC authors in the latter.34 These imbalances and the factors contributing to them need to be addressed, with a particular emphasis on correcting the under-representation of LMIC perspectives in the available evidence. Across the available evidence base, terms used for collaborations such as partnership, network and consortium are used inconsistently and interchangeably, a point also noted by others.59 89 Similarly, the concept of ‘(health) research capacity strengthening’ has been inconsistently applied across the broader HRCS literature.34 Thus, it is not entirely clear how an HRCS consortium might differ from a traditional health research consortium or how a consortium might differ from a partnership or network. Although not discussed in the literature, the lack of standard definitions and delineation of terminologies could lead to challenges with multiple perceptions of the nature and practices of a collaboration, as well as different partner expectations. Concerns about clarity in the use of terms contributed to efforts by Edwards et al89 to develop a typology of international health partnerships to facilitate evaluations by positing a classification according to the level of impact (individual or organisational), capacity strengthening approach and the type of relationship between partners. Beyond ensuring the use of appropriate comparators in evaluation,89 characterising collaborations and being explicit about the attributes of the collaboration and degree of involvement, for instance, should promote consonance in partner thinking, approaches and expectations. Our findings indicate greater emphasis on the relational aspects of management in the reviewed literature than on operational factors. Relational aspects such as relationship building, equity, power relations and leadership were identified as having the most influence on and requiring the greatest attention for successful HRCS consortium management. Though extensively mentioned, these elements were inadequately interrogated. It would be valuable to examine in more depth, for example, the different approaches to leadership (in theory and practice) and the sources and influences of power and power relations in the context of HRCS consortia. Operational aspects of management such as establishment processes, and governance structures and procedures, were given less attention. Given that relational and operational aspects of collaborations have been identified as interdependent elements of consortium management,45 90 91 it is unclear why the operational aspects are relatively neglected, and the interdependency and interplay between the two largely ignored. Only three papers hinted at any linkages.45 77 78 For example, Van der Veken et al78 pointed out that inequity and power imbalances are as determined by consortium structures as they are by pre-existing contextual factors, and Vasquez et al77 noted that formalised consortium structures are not sufficient in themselves in addressing power differentials and ensuring equity without commitment to the appropriate principles. The lack of correlation between relational and operational elements in the literature is further evidenced in the linear nature of the partnership frameworks applied in the reviewed papers which rarely elicited the relational complexities inherent in consortium processes. Indeed, the importance of this interdependency is also recognised in business partnerships where emphasis is placed on going beyond formal governance structures to fostering collaborative relationships and behaviour.92 93 There is a growing recognition of the significance of this interplay in the health systems context where the need to equally pay attention to strengthening organisational hardware such as finances and technology, tangible software such as systems and procedures, and intangible software such as relationships and power has been emphasised.94 95 Thus, in future research, it will be worth examining how the relational and operational aspects enhance or hinder each other, and a first step will be to unpack and examine both the conceptual and practical content of each aspect particularly pertaining to the research capacity strengthening context. Exploring this interrelatedness will contribute to a more nuanced understanding of consortium management and contribute to the development of more holistic frameworks for guiding consortium operations and management. Very little association has been made between HRCS consortium processes and capacity outcomes in the literature. There was almost no discussion in the reviewed literature on the ‘position’ of management in the HRCS effort and whether it merely supports a capacity development process or is a capacity development mechanism or target in its own right. This gap may be a result of the prevalent focus on HRCS activity outputs such as individuals trained and research conducted which are widely used as proxies for capacity,96 and the apparent prioritisation of technical research skills over managerial expertise. Though HRCS activities focus more on technical research tasks than non-technical relational skills, the emphasis in the HRCS consortium management literature is on the latter. This could be an indication that consortium processes may be segregated from the capacity strengthening process and only perceived as a means to an end. Though there is a growing recognition of the role of management in HRCS consortia, its handling in the available published literature is rudimentary. Even where management is explicitly named as an output, the focus remains on programme efficiency with management a facilitator of other programmatic outputs rather than a valuable capacity building output in itself.42 Besides, even programmes with explicit capacity strengthening strategies appear to be prioritising the ‘research’ over the ‘capacity’.9 In addition to ensuring HRCS programme models have ‘dedicated’ capacity strengthening foci,9 it is our view that the recognition and utilisation of management processes as capacity strengthening mechanisms in their own right are essential if research capacity goals are to be met. Considering the philosophy underpinning HRCS consortia,1 capacity development needs to permeate both processes and deliverables, and it is essential that both technical components and management approaches and processes adopted contribute to the capacity strengthening outcomes. As demonstrated by the UK Department for International Development’s example of impelling the incorporation of consortium management into programme theories of change,30 funders could play a key role in driving the prioritisation of consortium management and ensuring it receives adequate support (including funding) in its operationalisation and evaluation. This has been evidenced in the HRCS movement where funders such as the US National Institute of Health and the European Commission ensure that funding is committed to capacity building even in primarily research-oriented programmes. The consortium model has been widely adopted for strengthening health research capacity in LMICs. Yet, the evidence base to inform HRCS implementation is weak, and HRCS consortium actors lack the theoretical and empirical bases for framing their practice. From the limited evidence published to date, relational aspects of consortium management have been recognised as essential to HRCS programme success but not examined in depth. Operational processes have rarely been discussed, and it is unclear whether this is due to a lack of understanding or a lack of perceived importance. As a result, the interplay between operational and relational aspects of consortium management has not been well explored. The actual contribution of consortium management to HRCS outcomes is poorly documented, and the ‘position’ of management within the broader capacity strengthening agenda remains unclear. Considering the growing investments in consortia implementing the LMIC-focused HRCS agenda, it is essential to advance a corresponding consortium management framework to underpin the effort. The proliferation of HRCS consortia provides opportunities for further research towards broadening the evidence base. The gaps identified in the literature highlight the need to pay more attention to both theoretical and empirical investigation of consortium management processes, influencing factors, and their role in attaining the capacity strengthening aims of consortia. Such research needs to aim for more conceptual depth, making use of robust study designs and adhering to research reporting requirements to overcome the quality problems identified. It is also essential to ensure definitional clarity and operational interpretation of key influencing factors such as equity, power and leadership particularly in the HRCS context, thus supporting appropriate translation into much-needed practical guidelines for funders and research practitioners. These may be useful initial steps in strengthening HRCS implementation science and boosting the evidence base needed for policy and practice. This manuscript is published with the permission of the Director, Kenya Medical Research Institute (KEMRI).
. Health research: essential link to equity in development. Oxford: Commission on Health Research for Development (COHRED), 1990.
. The 10/90 report on health research 2000. Switzerland: Global Forum for Health Research, 2000.
. Beyond aid: research and innovation as key drivers for health equity and development: Council on Health Research for Development, Global Forum for Health Research, 2012.
. The World Health report 2013: research for universal health coverage. Geneva: World Health Organisation, 2013.
. Meeting the challenges of North-South Collaboration: the case of HIV prevention for rural youth, Edo state, Nigeria. Afr J Reprod Health2012;16:127–46.
. Multi-institution research centers: planning and management challenges. Journal of Research Administration2016;47:32–48.
. Mid-term evaluation of DFID’s health research programme consortia: synthesis report. Mott MacDonald, 2015.
. Research fairness initiative summary guide. Geneva: Council on Health Research for Development, 2018.
. A guide for Transboundary research partnerships: 11 principles. 2nd edn. Bern Switzerland: Swiss Commission for Research Partnerships with Developing Countries (KFPE), 2012.
. Guidance: how to draw up your consortium agreement. Brussels: European Commission, 2015.
. The world by income 2018. Available: http://datatopics.worldbank.org/world-development-indicators/the-world-by-income-and-region.html [Accessed 2 Jan 2019].
. Proposal: a mixed methods appraisal tool for systematic mixed studies reviews. Montreal Canada: Department of Family Medicine, McGill University, 2011.
. Building psychiatric clinical research capacity in low and middle income countries: the Cuban-Canadian partnership project. Innov J2010;15.
. Best practice in north-south research relationships in higher education: the Irish African partnership model. Policy Prac2010;10:89–98.
. APPENDIX C: Reliability-tested guidelines for assessing participatory research projects. In: Minkler M, Wallerstein N, eds. Community-based participatory research for health: from process to outcomes. 2nd edn. San Francisco: Jossey-Bass, 2008: 407–33.
. The model: an overview of Capacity WORKS. In: GmbH G, ed. Cooperation management for practitioners. Springer Fachmedien Wiesbaden, 2015: 7–29.
. Learning Together: a Canada-Cuba research collaboration to improve the sustainable management of environmental health risks. Can J Public Health2006;97:50–5.
. Establishing long-term nursing informatics capacity in Malawi, Africa. Stud Health Technol Inform2016;225:1013–4.
. University partnerships for academic programs and professional development. Bingley UK: Emerald Group Publishing, 2016.
. MOPAN 3.0 methodology manual: 2017-2018 assessment cycle. Multilateral Organisation Performance Assessment Network, 2017.
. Simple Rules for making alliances work. Harv Bus Rev2007;85:122–6.
. Collaborative advantage: the art of alliances. Havard Business Review1994;72:96–108.
. Crises, Routines and Innovations: The complexities and possibilities of sub-district management. In: Padarath A, English R, eds. South African Health review 2012/2013. Durban: Health Systems Trust, 2013.
. The concept of capacity. study on capacity, change and performance. Maastricht: European Centre for Development Policy Management2006. Contributors NT, SM, JP and SK were involved in conceptualising and designing the review. NT led the search, screening, quality appraisal and analysis of the data. SM, JP, VIM and SK quality checked the selection process and the extracted data and were involved in the quality appraisal and analysis. NT prepared the first draft and all authors contributed to the content, review and revision of the manuscript. Funding This work was supported through the DELTAS Africa Initiative [DEL-15-003]. The DELTAS Africa Initiative is an independent funding scheme of the African Academy of Sciences (AAS)’s Alliance for Accelerating Excellence in Science in Africa (AESA) and supported by the New Partnership for Africa’s Development Planning and Coordinating Agency (NEPAD Agency) with funding from the Wellcome Trust [107769/Z/10/Z] and the UK government. The views expressed in this publication are those of the authors and not necessarily those of AAS, NEPAD Agency, Wellcome Trust or the UK government. Data sharing statement All data will be made available on request.